Add a knob: Add a Mix Knob Q-Tron or Q-Tron+ $70 [Add $70.00]When in MIX mode, you can set the blend of dry vs effected sound. The Mix knob will be on the top row next to the other knobs. Analog Man carries the Electro-Harmonix Q-Tron Envelope Filter. This new effect uses the same opto-electronic design of the Mutron-III and has an increased frequency response and an improved signal-to-noise ratio. Mike Matthews, founder of Electro-Harmonix, and Mike Biegel, designer of the Mutron III, have together created the first all-new Electro-Harmonix product in 15 years: The Q-Tron envelope controlled filter. This new effect uses the same opto-electronic design of the Mutron-III and has an increased frequency response and an improved signal-to-noise ratio. Has all Mutron-III features plus switchable Boost and Filter Mix mode. Drive Switch (up/down) - selects direction of filter sweep : up (wah) or down (ow). Range Switch (Hi/Low) - Emphasizes vowel like sounds in low position, overtones in high position. Gain Control (0-11) - Functions as both a volume control and a filter sensitivity control in boost mode. In normal mode it acts only as a filter sensitivity control, unlike the Mutron-III which also changes the unit's output volume. Boost Switch (Normal/Boost modes) - Normal mode allows setting the Gain control without changing the output volume. Peak Control (0-11) - Determines frequency peak of filter. Makes more "effected sound" when turned up more. Mode switch (LP, BP, HP, MIX) - Select the frequency range for the filter to sweep. Low Pass is lows, Band Pass is midrange, High Pass is treble. MIX mode (new feature not on the Mutron-III) combines BP with dry unprocessed sound. Bypass switch (in/out) - Turns effect on and off. Includes 24 volt AC adaptor (will not run on batteries). 2 outputs - normal and effected outputs. 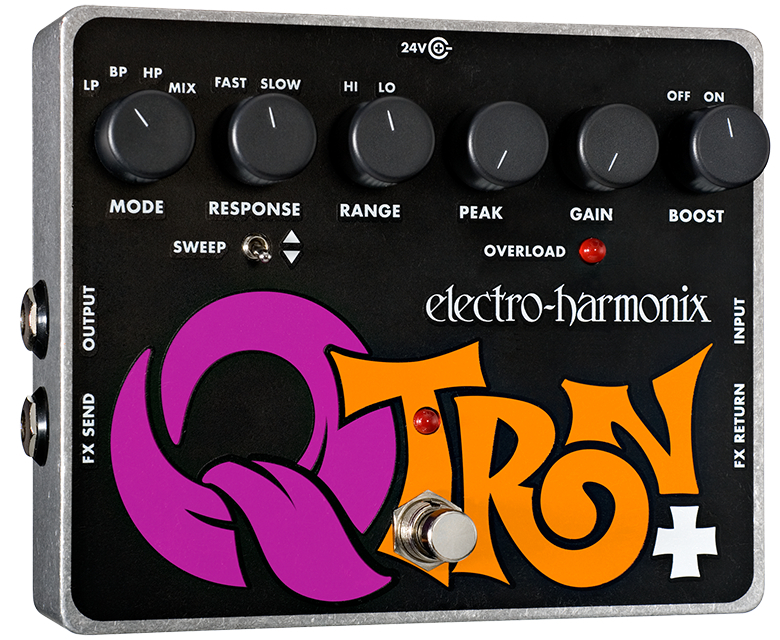 Here is more info on the Q-tron with sound samples on the Electro-Harmonix site. Here's a great article by Mike Biegel (Q-Tron designer) and Elliot Randall, about envelope filters, from 1980. In mid 2008 the Q-Tron is now coming in the small box like the Q-Tron+. We can mod those for the MIX knob also now! The Q-Tron+ Envelope Follower adds the power of a built-in Effects Loop and Attack Response Control to the proven platform of the original Q-Tron. The unique Effects Loop lets the musician place a sound effect between the Q-Tron+'s envelope detection circuitry and filter sections without changing the envelope drive. The rich harmonics created by a distortion pedal can now be processed by the filter without degradation to the signal's natural envelope and with full dynamic response. Electro-Harmonix claims that plugging other devices, such as the Electric Mistress Flanger or Deluxe Memory Man Analog Delay into the Q-Tron+ Effects Loop creates an array of exotic new sounds. The Attack Response Control lets the player select between a slow, smooth, vowel-like attack and the fast, snaked response of the original Q-Tron. Comes with a special USA power supply, UK or Euro supplies are optional.